Outs: Saints: James Craig (concussion), James Fish (ankle), Paul Hill (shoulder), Rory Hutchinson (knee), Toby Trinder (foot), Ken Pisi (shoulder), Heinrich Brüssow (concussion), Nafi Tuitavake (neck), Andy Symons (knee), Piers Francis (concussion), Jamal Ford-Robinson (knee). Tom's preview: There have been some emotive east midlands derbies over the years, but Saturday's encounter at Twickenham might just top the lot. The sight of Rob Horne will be enough to inspire some powerful feelings, particularly in the Saints camp. And, just as they did when they pulled together to win at Welford Road back in April, you can be sure the black, green and gold will be using the Australian ace to drive them on. There will be a sense in both dressing rooms among the players chosen to take to the field that they are the lucky ones. The ones who are still able to have a say on derby day. But though Horne won't be able to have an impact on the field, his presence off it will be key for Saints once again. After the win at Welford Road - Saints' first at the home of their rivals for more than 11 years - members of the Northampton side paid tribute to Horne. They had no idea at the time how serious the injury he had sustained just 12 seconds into the match would be. But they were quick to hail his influence in the preparations for what was a simply stunning 27-21 success. 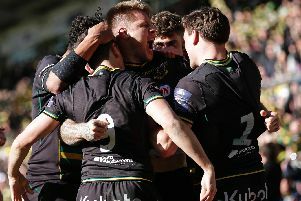 Horne, who was skippering Saints for the first time in just his 21st and, as it turned out, final appearance for the club, had lead the team throughout derby week. His sheer will to win and measured approach to proceedings put his team in a position to do something that had eluded so many other Saints sides. And even though he was off the field after an unfortunate collision with Sione Kalmafoni almost straight from the kick-off, what he had said and done during the previous seven days had worked wonders for Saints. Because, let's not forget, they had been smashed by Saracens 63-13 on the previous weekend, with heads dropping after a second-half evisceration at the hands of the eventual champions. But, having never shirked a challenge in his career, Horne refused to let them. He helped to pick players back up and put the confidence back into them. By the time kick-off came at Welford Road, Saints were believing again. And even though Horne couldn't help them see things through, his work had been done. Not that you would ever hear him take credit for any of it. He is as modest as they come. But what is clear is that players' player and supporters' player of the year Horne had such a huge say on life at Saints during his single season at the club. As Saints forwards coach Phil Dowson said: "He came to the club after a pretty stellar career in Australia and it wasn't one of those where he just wanted to travel and see the country - he wanted to win. "And certainly after that shocker of a Saracens defeat at home, the way he spoke to the players and led the team that week was incredible." Horne was asked what he would say to his team-mates in the build-up to this week's game, but he did not want to be drawn into that. Instead, he is happy to sit back and watch them do their stuff, once again believing that his mates can get over the line when it matters. But whatever the result, the way the rugby community has united since Horne's tragic accident has been nothing short of remarkable. Inadvertently, he has once again brought a group of people together, just as he did before derby day back in April. Horne might no longer be playing, but his courage and determination, especially since enduring the arm injury that ended his career, is a lesson for all. And on a day when every player will be asked to give everything for their respective cause, they need look no further than the man who this is all about.